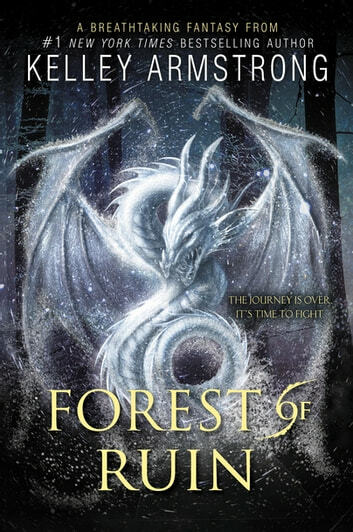 In this breathtaking final book in her epic trilogy, The Age of Legends, #1 New York Times bestselling author Kelley Armstrong blends fantasy, action and romance to give readers the unforgettable ending they've been waiting for. The empire rests on the edge of a knife, and sisters Ashyn and Moria are the handle and the blade. Desperate to outmaneuver the evil Alvar Kitsune, whose hold on the people grows stronger every day, Emperor Tatsu begs Moria to put aside past grievances and ally with Gavril--at least long enough to make an attempt on Alvar's life. Meanwhile, reunited with her long-lost grandfather, Ashyn discovers that she is the key to a ritual that could reawaken an ancient dragon and turn the tide of the coming battle in their favour. But with lies and betrayal lurking around every corner, Ashyn and Moria will have to decide once and for all where their allegiances lie. And it may not be where their hearts would lead them. I really enjoyed this series. It was fast paced, and exciting. Kept me reading into the night! The characters are memorable and the plot engaging. I was sorry to see it end. This is a fabulous series. I came across it by accident and Loved it all. Sad when the series came to an end. It captures you the entire time. I fell in love with all the characters. Laughed and cried along with them. Ps not just for teens. Good series with a few surprises. Enjoyable read. An unexpected twist almost at the end. Would read again.